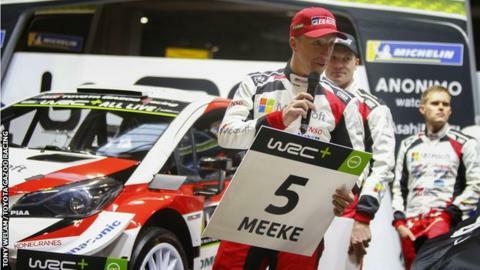 Northern Ireland driver Kris Meeke came in sixth and over a minute behind winner Ott Tanak at Rally Sweden on Sunday. The Dungannon man started the final day in sixth place in his Toyota and that's where he finished, with a gap of 1:38.8 minutes to team-mate Tanak. Esapekka Lappi and Thierry Neuville completed the top three. Meeke remains fourth in the championship standings, 26 points adrift of series leader Tanak. The 39-year-old moved up two spots early on Saturday and he remained in sixth for the remainder of the day. Meeke went into Sunday's three stages 1:36.5 minutes behind Tanak, who held a 54.5-second lead over Andreas Mikkelsen. He also finished sixth in last month's season-opening Rally Monte Carlo after having tyre troubles. However, his win in the final power stage in Monte Carlo earned him bonus points which left him fourth in the world championship. Meeke is competing for Toyota this season after being dropped from Citroen's line-up midway through the 2018 season.